Use this feature to reconcile bank account information in Procare with your actual bank statement. If you are just starting out with bank reconciliation you’ll likely have some old items you need to reconcile from the past. See: First Time Reconciliation. From the main screen of the Expenses & Ledger module go to Functions > Reconcile Bank Accounts. Select a Bank Account. Only asset accounts that have been set up as Bank Accounts will be available. From your bank statement enter the ending Statement Date and Ending Balance. Note: The Beginning Balance will be entered automatically based on the ending balance from the last time you reconciled this account. If this is your very first reconciliation you’ll need to enter the beginning balance from your statement. Use the Bank Fees and Service Charges section to record any fees you haven’t already posted in a Journal Entry, otherwise skip this step. Select the General Journal to which these fees should be recorded such as “Bank Fees”. Choose the GL Account number for this expense such as 5090.00 Bank Fees. Enter the total of all fees shown on your bank statement. If there are several different fees add them together. Select the General Journal to which this money should be recorded such as “Miscellaneous Revenue”. Choose the GL Account number for this revenue such as 4104.00 Interest Revenue. Enter the total of all interest earned on your bank statement. Now you’ll have a chance to indicate which items have cleared. Under Display Items (at the top) choose to view All Unreconciled items or any items during the specified dates. On the Deposits tab mark any deposits which have cleared the bank (those that appear on your statement). Note: As you check off each item it will be added to the Cleared Item Total (lower left). On the Other Credits tab mark any items which have cleared such as journal entries that increased the bank balance. On the Checks tab mark any checks which have cleared. On the Other Debits tab mark any items which have cleared such as journal entries that decreased the bank balance. A summary of balances appears in the lower right. When the Difference is zero you may choose Reconcile. Hint: If you are not ready to complete the reconciliation you may Save it for later. 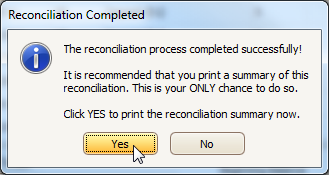 When the reconciliation is complete you’ll be asked if you want to print a summary. Important! This is YOUR ONLY CHANCE to PRINT the RECONCILIATION SUMMARY. Say Yes. Hint: if you need to unreconcile an item later use the Edit Register button. Use Import Statement to import an electronic statement in OFX, QFX or QIF formats. This may be available from your bank or through third party financial software like Quickbooks® or MS Money®. How do I check my bank balance?